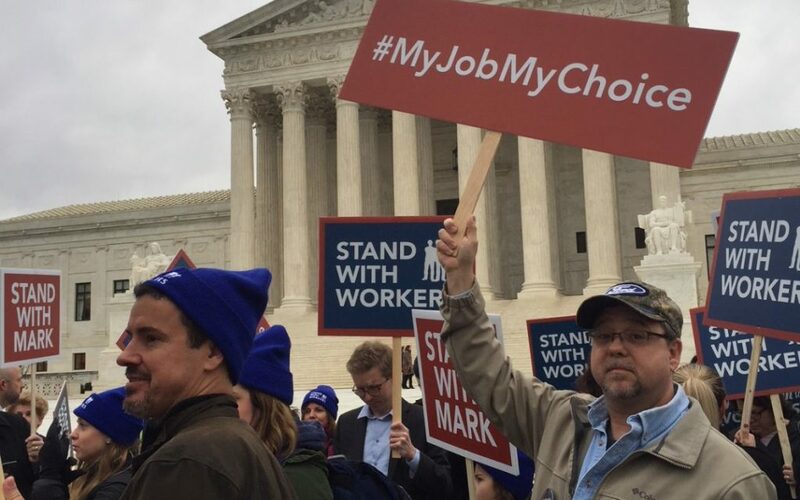 The Supreme Court on Wednesday ruled 5-4 in favor of Mark Janus in the hotly contested Janus v. AFSCME case. The case was controversial to say the least: Unions say it is a case of billionaire-backed interests trying to cripple labor unions, while think-tanks, legal foundations and some state employees say it is a free speech matter. So here are five things you need to know about the Janus ruling and how it will affect Connecticut state and local employees. This is the core of the Janus decision. Government employees could always opt out of union membership, but were still required to pay “agency fees” to unions for collective bargaining representation. This precedent was established in the 1977 Supreme Court ruling Abood v. Detroit Board of Education. Under the Janus ruling, those members who opt out of union membership, no longer have to pay fees. The Supreme Court went a step further than just saying union members could opt-out of union membership without paying fees. The court ruled government employees must affirmatively consent to union membership, meaning they cannot have dues automatically deducted from their paychecks when they are employed by state or local government. They must affirm union membership through signing a union card before dues will be deducted and they will not have agency fees deducted from their pay — or lose their job — by not signing the card. This has been an issue in the past for new employees who have dues deducted from their pay during probationary periods when they are not yet union members. While the state will no longer collect agency fees from non-members, current members who want to opt-out may face some restrictions depending on which union they belong to. Union contracts and membership cards contain opt-out provisions. Most state employee contracts require only 30 day written notice, but some contracts and membership cards contain time restrictions. For example, AFCSME membership cards say a member can only opt out during a 30 day window coinciding with their membership anniversary date. The Supreme Court ruling may call these restrictions into question, inviting future legal challenges. Furthermore, in preparation for the Janus ruling, some unions held card-signing campaigns with revised opt-out restrictions. Unions argued agency fees were to prevent “free-riders” — non-members who still benefit from the wages and benefits negotiated by the union. The Janus ruling says unions cannot differentiate between members and non-members and must represent all employees fairly. According to the decision, a union’s “duty of fair representation is a necessary concomitant of the authority that a union seeks when it chooses to be the exclusive representative.” The Court said there are other ways a state could handle the “free-rider” issue without extracting fees. The Court also notes that unions in right-to-work states have willingly represented nonmembers. The 2017 SEBAC Concessions Agreement negotiated between Gov. Dannel Malloy and state government labor unions protects state employee pensions and retiree healthcare until 2027 regardless of whether or not that state employee remains a union member. Future negotiations between the governor and SEBAC notwithstanding, union members and non-members will received the same benefits, wages, etc. negotiated by the unions. Who pays for arbitration, grievances, mediation, etc. if everyone in our union switches to agency?